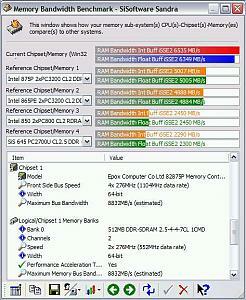 I received my OCZ GoLD-4000 series Dual Channel DDR, 2x512MB sticks, and threw them in the Epox 4PCA3+. It's not as "PATsy" as the other Canterwood boards, eschewing all the GAT type settings except for two, "Intel Memory ...CS", and "...CPC" (Coomand Per Clock). CPC is almost always Disabled, and should be with the GoLD series regardless. 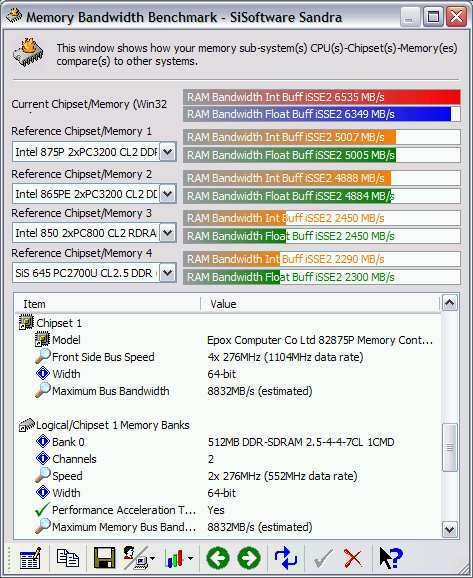 Where the board's strength lie is in it's VDIMM 3.30V max. Yet the Vcore is limted to 1.6V. I'm finding each board seems to have it's Achilles Heel, and they keep coming up, and hitting me on my overclocked chin. Abit's IS7-E, and IC7-G are l;imited in their VDIMM's which both are maxed at 2.8V, yet their Vcore limit is 1.9V. The voltage is insane, for a Pentium, and is entirely unbalanced from the VDIMM? 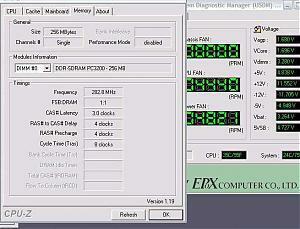 Epox is in dire need of a BIOS revision. The shipping BIOS had NO PAT settings at all! Very strang for a Canterwood mobo. As I said the revision simply offer's two "PAT-like" settings. And addresses a; "...crakcling sound while playing music" fix. I fail to see the point of PC4000 in the state that it is in now. The timings are so rediculusly high that the higher clock speed is (almost) completely offset. 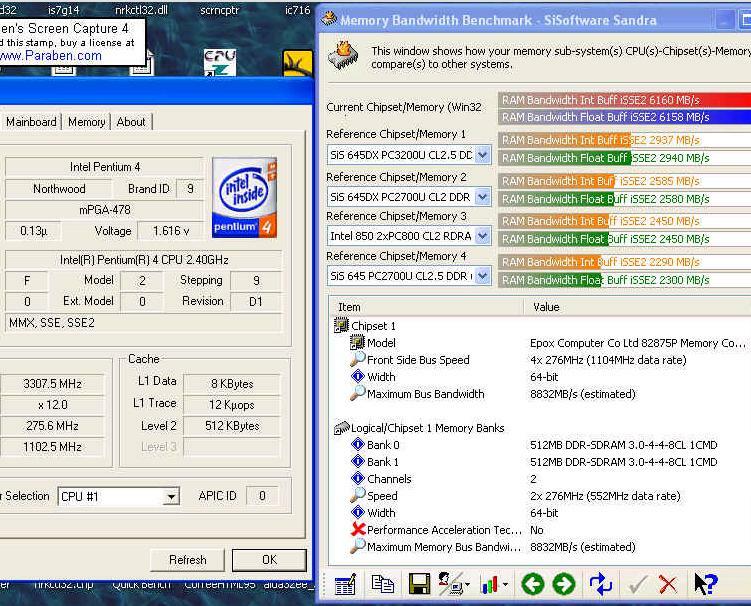 For example, I nearly get that score in Sandra on my IC7 running the memory at 220 MHz from a 5:4 divider. The timings are 2-6-3-2. 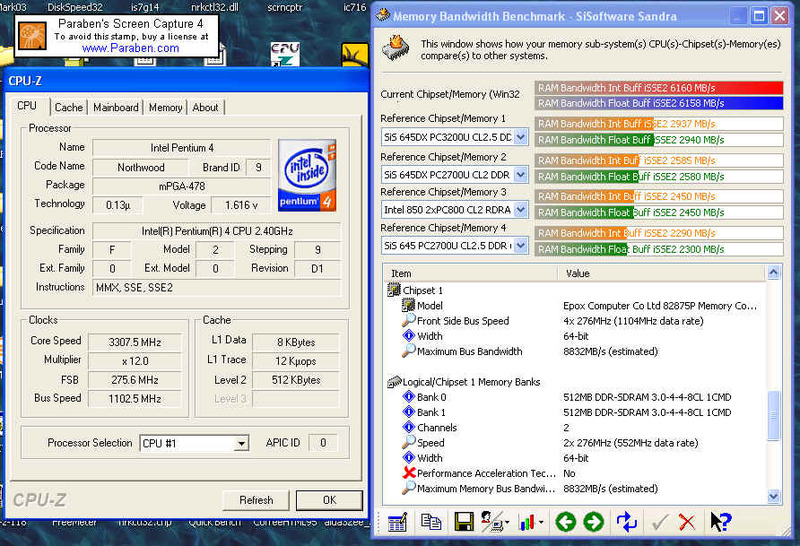 I could probably achieve higher results than you did by simply running the memory at 225 MHz with timings of 2-6-2-2. 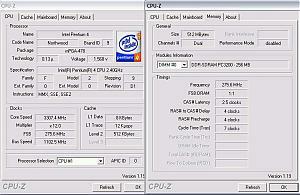 Well, not too simply considering my Corsair PC3500 can't run quite that fast with the low voltages available with the IC7, but you get the point. Ouch. I sure do. You are "TheDude's" alter-ego. Very appropropriate username. But it's not about Bandwidth, it's about having fun running a FSB of 276MHz, that's why the thread isn't titled "6100MB/s Bandwidth to save a life." EDIT: forgot to reply to this sorry. TheOtherDUde no I was just kidding, sorry I didn't mean to make it seem so serious, and you have some valid points about the new PC4000, the timings are silly, but there's something going on at DDR500, and i beleive it has to do, with the semiconductor industry on the whole. I don't think their on the same schedule in so far as "acaling" goes as CPU makers. I just think their either so dicombobulated tre-tooling for DDR-II, or droppping to .11-micron die, there's some reason these 4ns IC's just can't run tight? Last edited by Liquid3D; 21st August, 2003 at 10:19 PM. I can certianly understand that. I hope that's not serious. I didn't mean to offend you. It's probably worth it, for you, just to be able to run the higher FSB. Just out of curiosity, can that memory run at lower timings when the clock rate is slower? Say, 2-2-6-2 @ 225 MHz? I have to admit that A-DATA ceratinly has some sweetness IC's. What are they using? Nice Bandwidth, you hit the maximum projected from the 875 NB-MCH plus some! i think they might be using Hynix D43 like xms4000 and ocz pc4000 ? 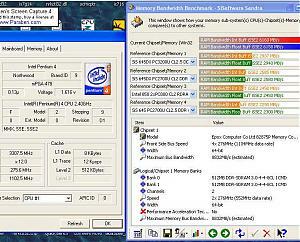 I have same RAM (OCZ4KG) and have been more than happy with it. Well worth the money. .....Just out of curiosity, can that memory run at lower timings when the clock rate is slower? Say, 2-2-6-2 @ 225 MHz? I haven't tried really fast memory so I can't be sure. But, I've heard a lot of complaints. 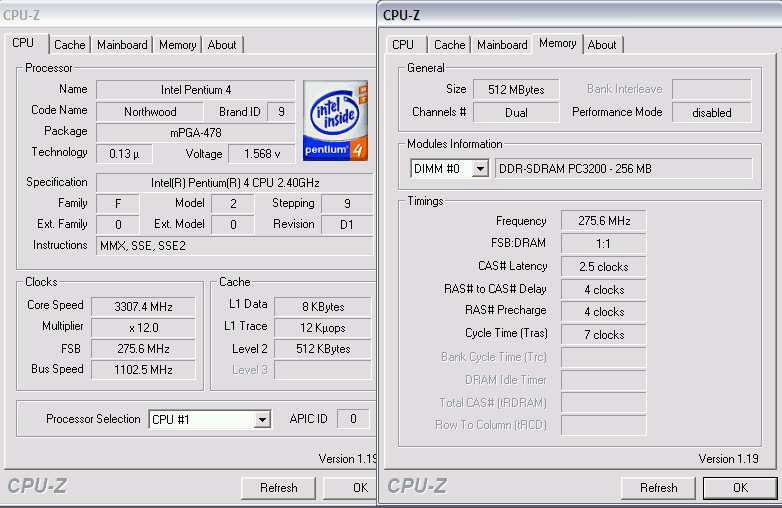 In general, I believe that sticks meant to run 233+mhz (PC3700 & PC4000) are unable to run fast timings even at 200mhz. I'd be lying if I said I understood it completely. Personally, I think the sweet spot in performance is in high quality PC3500... They are often offered at tight timings, eg cas2 6-3-3 or so. I tend to think the performance is very close, and you can try to overclock it for more while retaining the tight timings. your right about that. However it's the nature of the beast at the moment. i've spoken with several memory manufacturers, and it's just not possible to get these DDR500 memories down in their Latencies, however this also has a lot to do with the Canterwood/Springdale chipsets. PAT "imposes" certain latencies within the MCH, and if the memory is tRAS-2 a conflict results. For this reason your seeing the higher timings in addition to this being the end of DDRI's life cycle. 275FSB is an amazing speed, and the bandwidth resulting from it, is quite satisfactory as well. Where people are taken-aback is on these CAS-3-4-4-8 timings. Well think about it? 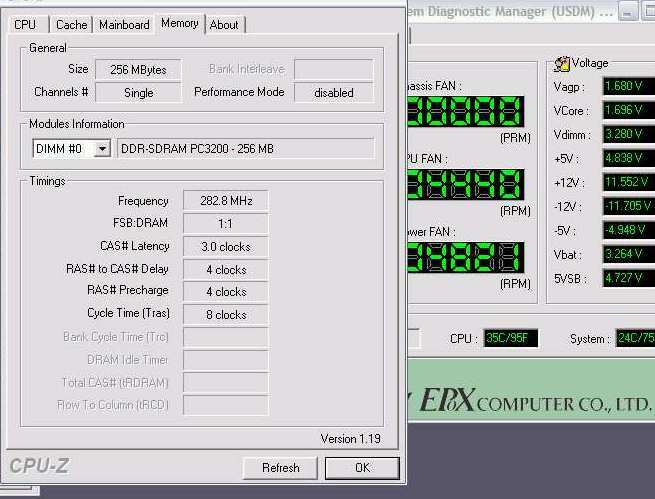 Were running DDR550, AND you want to reduce the timings to 2-2-2-5 Come on people, lets get realsitic. Try to remember where we were a year ago today when DDR was just relaseaed. We started out with DDR266, off a 133FSB, were now running from 200FSB, and in afct my system is totally stable at 265FSB to 275FSB and you want LL to boot (pun intended)? And be prepared because DDR-II is going to start at high latencies as well, expect to see CAS 3-4-4-7 at DDR-II500.